I continue to dig on the Scout class figures in the ongoing Transformers: Hunt for the Decepticons line, and this great bright yellow 'flying wing' model is no exception! Sunspot apparently is suffering from exactly what his name implies, and seems to have as poor a memory as your humble Preserve narrator! He tends to forget to look out for Autobots, forgets his orders, but fortunately never quite forgets how to keep in the air. 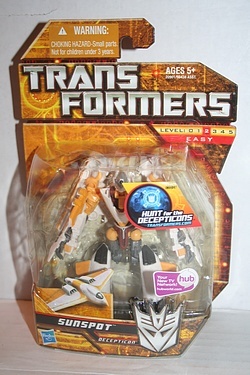 Click the image above for more shots and the full bio and stats of this daffy Decepticon flyer!